This class is aimed for our parkour athletes ages 3-5. Students will practice and incorporate their skills into games such as tag and the color game! Students will learn basic movements from various categories including floor skills, vaults, wall movements, and movements on the bars/ropes. They will practice and incorporate the skills they learn into games such as tag and the color game! Parkids 301 LVL2 is only for parkour athletes ages 8 - 13 who have already achieved their LVL 2 band or above. Students will gain the skills and experience to plan and execute traversing obstacles using parkour specific movements. Rolls include shoulder rolls, reverse rolls and rolling out of other movements. Jumping topics include jumps at different elevations, precision jumps, and different stride variations. Vaults include the safety vault, speed vault, kong vault, and more. Wall movements include wall runs, wall pop, wall to cat climbs, 270 wall runs, tic-tacs, and wall flips and variations. Bars/ropes include pullovers, laches, laches to precision, and rope climbs/swings. Time trials and games like FLIP will test their skills. 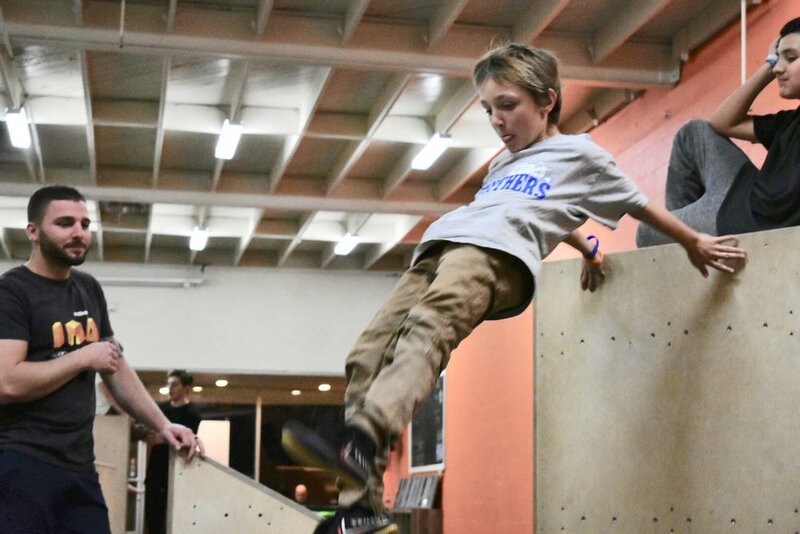 This class is aimed for our parkour athletes ages 5 to 8. Students will learn basic movements from various categories including floor skills, vaults, wall movements, and movements on the bars/ropes. Floor skills include shoulder rolls, jumping at different elevations, precision jumps, rolling out of jumps, handstands, and cartwheels. Vaults include the safety vault, speed vault, kong vault, and more. Wall movements include wall runs, tic-tacs, wall pops, and cat climbs. Bars/ropes include laches, regrips, and rope climbs/swings. Perfect for any family (home-schooled or not) looking for a class early in the day for kiddos ages 5 - 13. We are an approved vendor for Inspire Charter Schools, you can enroll your student using an enrichment certificate from ICS. Not enrolled in ICS? No problem! Other home-school students are always welcome! More than the extreme videos seen on YouTube, Parkour is a discipline based in hard work, and consistent training of basic human movements like Striding, Jumping, Rolling, Balancing, and Climbing. You don’t start trying to jump across a 10-foot gap, you start by jumping in place! And you do it over and over until you’re jumping a little higher and a little further, building confidence, coordination, and mental toughness. This class is open to all backgrounds and no experience is required. Designed for our LVL 0 - LVL 2 parkour athletes ages 8-13. Athletes will practice and incorporate the following skills into games such as time trials and Lava Floor! Floor skills include shoulder rolls, jumping at different elevations, precision jumps, rolling out of jumps, handstands, cartwheels, and round-offs. Vaults include the safety vault, speed vault, kong vault, dash vault, and more. Wall skills include wall runs, wall to cat climbs, 270 wall runs, tic-tacs. Bars/ropes include pullovers, laches to precision, regrips and rope climbs/swings. We strive to make all our classes inclusive and fun environments, but some kids may prefer a spectrum friendly time. We will run fast, jump, climb and balance on obstacles in a fun, motivational environment to develop areas of strength, movement, and sensory processing. Parents or therapists are welcome to assist and typically developing siblings are encouraged!